Back in September, we reported that Skil is positioning itself to reshape the DIY landscape. Now it’s time to see if they can deliver. Today, I have my hands on the new Skil 12V 2-speed brushless drill – the PWRCore DL529002. Skil says they’re a DIY brand and I have zero hesitation in recommending this drill for anyone in that space. Pros should take a look as well if you’re considering a 12V drill to supplement your 18V model. The price is right and the performance is there. As a bare tool, the Skil 12V 2-speed brushless drill is DL529001. It’s also available with a standard charger as the Skil DL529003. The kit I’m reviewing includes a PWRCore 2.0 Ah battery and PWRJump charger. The difference in chargers is that PWRJump will give you get you up to 25% in just 5 minutes. It also includes a USB charging port for your devices. There’s nothing really lacking on the feature set for a drill that’s positioned for the DIY market. The Skil 12V 2-speed brushless drill doesn’t stray far from the designs we see in the Pro market. In fact, it reminds me quite a bit of Makita’s 12V CXT drill, and I mean that as a compliment. The handle and grip are very comfortable. Going with a slide-style battery pack is a good move that gives Skil a lot of freedom with the handle diameter and shape. It also keeps the rocker switch in easy reach to switch between forward and reverse with one hand. With the battery, the drill weighs 2.9 pounds. That gives it some heft, but it’s the kind of weight that feels more well-built than made with cheap, heavy components. Part of that feeling comes from the fact that the balance is pretty solid. When you get that right, there’s a feeling of greater quality than having the same weight that’s off balance. In the grand scheme of things, 2.9 pounds is on the heavy side for a 12V drill. However, most of us on the Pro side turn to 12V drill to get a lighter weight and smaller size than our 18V tools, and Skil accomplishes that easily. Skil’s 1700 RPM and 350 in. lbs. of torque give them enough confidence to put a 1/2″ chuck on the drill instead of the 3/8″ you find on most others. That doesn’t mean you should be putting a 6″ hole saw on it, though. 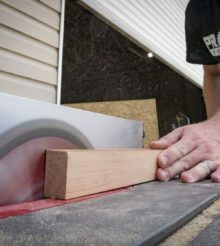 The chuck has a little bit of runout (wobble) to it that’s well within our comfort zone for a drill in the DIY class. It’ll pass muster even if we consider against Pro models. There’s little inherent vibration in the motor when you’re letting it spin free. However, it’s when you put the bit to the wood that tells a bigger story. I grabbed some 2x PT and my Bosch Daredevil spade bit set to see what this compact drill is capable of. In high speed (low torque), I was able to bore holes up to 3/8″ with no issue while 1/2″ bits needed a little help on the end. In low speed (high torque), it made it cleanly through 1-1/8″ bits and with a little trouble at the tearout point with 1-1/4″ bits. That’s impressive work for something that’s labeled “DIY”. More importantly, that’s reaching into Pro performance areas. The hybrid chuck is an interesting animal. It’s a standard 1/2″ chuck with a 1/4″ hex inside. It doesn’t have a collet like an impact driver, so you may want to lock it down with the chuck for a little extra security. You have some options in how you buy the Skil 12V 2-speed brushless drill. The kit I’m reviewing runs $79.99 on Amazon. The standard charger kit is $68.38 and the bare tool is $54.66. There are also some combo kit options to look through. What jumps out at me initially is the fact that Skil is only charging about $12 over their bare tool price to get a battery and standard charger. In the DIY space Ryobi’s 12V kit runs $49.99 and you can pick up a Black & Decker around $30. Neither have a brushless motor and neither list their torque values. You have to look to Pro brands to find brushless 12V tools and those will set you back more than $80. It looks like Skil comes out solidly at a true Prosumer level on the 12V platform than anyone else at this point. And it really seems like it fits more on the Pro side of that line than DIY. Ryobi has already proven the merits of that position with their 18V line. I came into this review with the idea that Skil is a DIY brand. That’s what they’re saying about their position, after all. But considering the performance, features, and feel of the Skil 12V 2-speed brushless drill, I have to wonder if this will become a go-to brand for Pros that just want core 12V tools to supplement their 18V heavy-duty ones rather than something that runs as deep as Milwaukee’s M12 line. It’s something to keep your eyes on for sure. There’s really no competition between this and other DIY 12V drills. It’s really a better comparison against 18V DIY drills where it still excels in performance with a much more compact design. Did you do enough testing to describe battery life? I’m really impressed with what skil is throwing out this year. A lot of competition definitely across the board. Eager to see what next year brings as well.